At Sierra Chevrolet, we're your one-stop shop for auto parts. Whether you need brake pads, oil filters, or anything else, we'll help you find the right part for your vehicle. Fill out the online form below and a service professional will get back to you soon. Are you trying to find the perfect part for your car? We realize it is hard enough to correctly identify the problem and install the part, let alone be able to find the one you require at a reasonable price! The good news is that the friendly team here at the Sierra Chevrolet's parts department in Monrovia can help you out! We have a huge supply of auto components on hand and we can help you figure out the perfect one for your need and budget. 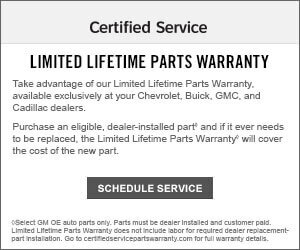 Speaking of selection, our Monrovia Chevrolet parts store is one of the biggest supplier in the area. So, no matter whether you require engine parts, brake pads or just the right Chevrolet accessory, Sierra Chevrolet is your one-stop shop.